Roche-Thomas Premium line of lubricants are formulated and bottled in our facilities suing a special filtering process that eliminates impurities and residue. Our unique process insures that you receive a fast acting lubricant with a clean coat, virtually dust and lint free. Our trombone slide cream comes in a 1 oz container. It is a silky smooth cream that won't leave your instrument greasy and waxy. No wax or grease is used in this blend. Use with a couple sprays of water (try our Roche-Thomas Bone Bottle, fine mist water spray bottle), to get the most out of the trombone slide cream. 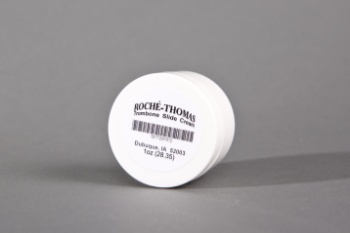 At Roche-Thomas we are proud that we can say our products are manufactured in the USA using products made in the USA, so you know you are purchasing the finest products on the market.